There are seemingly endless ways you can spend time promoting and growing your new online store. But for most e-commerce store owners, trying to tackle every method all at once isn’t the right way to drive growth. Not only will your efforts consume all of your time, but you’ll likely produce lackluster results. After all, it’s hard to do anything really well when you spread yourself too thin. The better approach is to choose a limited number of ways to promote your online store. Focus your efforts on those channels, and measure your results to see what’s working and what isn’t. Then, over time, you can expand and refine your efforts based on what you know is driving growth and sales. 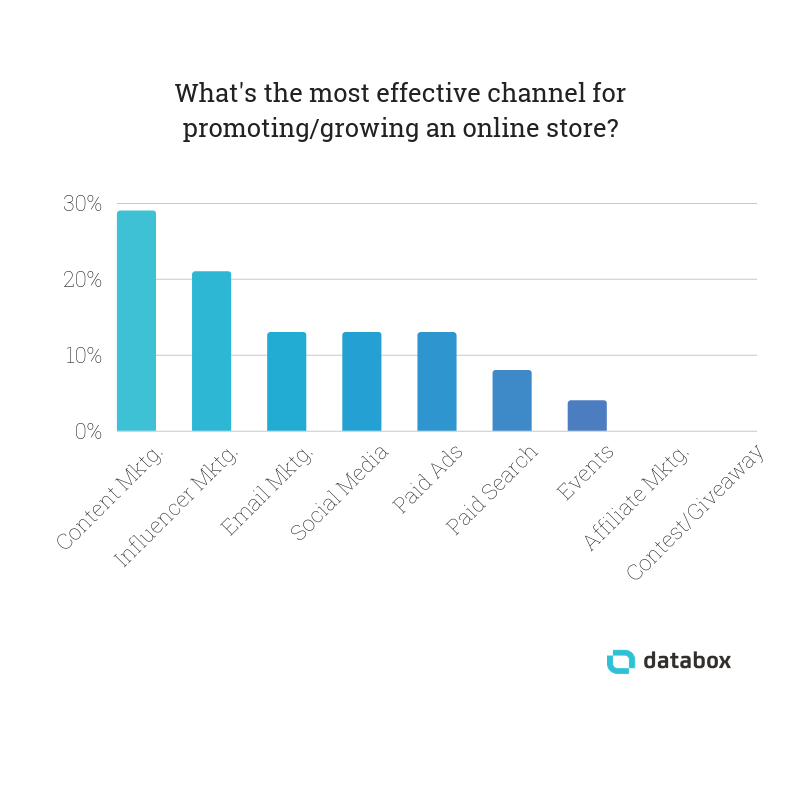 In our most recent survey, we polled a group of e-commerce marketers to uncover the most effective channels for promoting a new online store. Content, influencer, email, and social media marketing topped the list. We also asked our respondents to share the specific strategies they use to drive growth and sales on their recommended channels. Here’s what we learned. 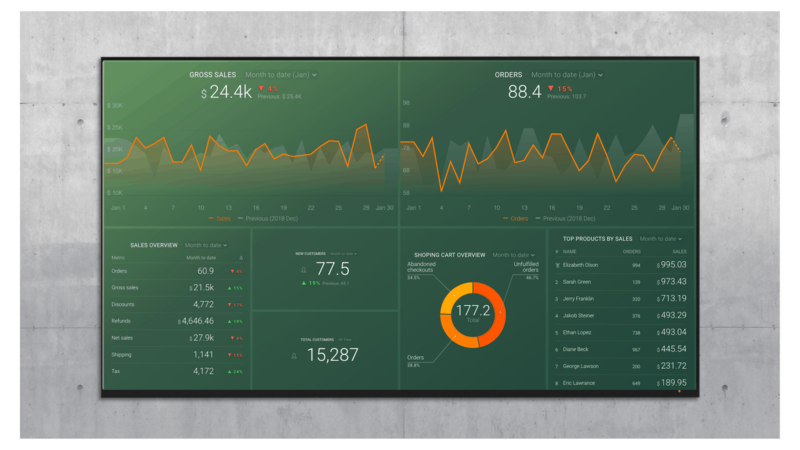 *Editor’s note: Take full control over the growth of your online store by having real-time visualizations of your key store performance metrics. Grab this free template and track how well you’re converting visitors to buyers, which products are most popular, gross sales, abandoned carts, and much more. So what specific tactics should you use? Our respondents offered several suggestions. 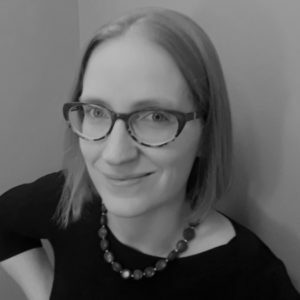 Bolton argues that running a blog is one of the best ways to create a loyal following and build brand awareness, particularly if you’re publishing top-of-the-funnel content. But other respondents recommend going beyond just publishing blog posts. 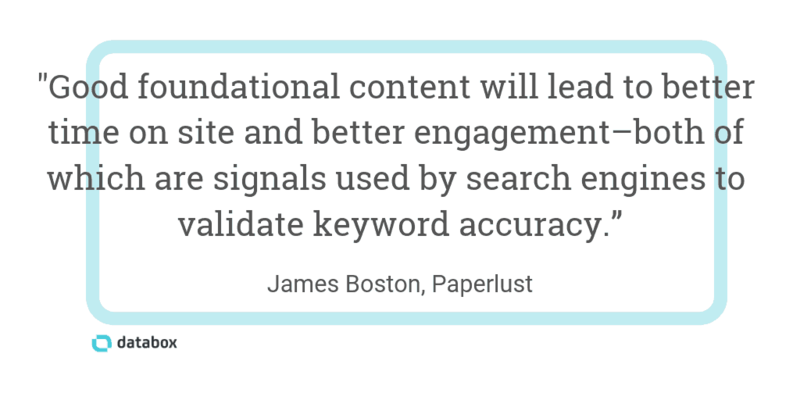 According to James Boston of Paperlust, combining content marketing and SEO is particularly effective when you’re marketing a product that has high search volume for generic terms (e.g. “wedding invitations”). “Influencer marketing is one of the most powerful ways to promote a new online store,” says Peacock Alley’s Ryne Higgins. The best part of influencer marketing is that it’s easy and inexpensive to get started. All you need to do is identify relevant influencers and send them your product to test and review. Dennis from Core dna shares a success story of how e-commerce startup Frank Body used influencer marketing to build trust in its brand and create a desire for its products. “We have the benefit of working closely with online stores on their marketing initiatives, and we consistently see email marketing generate a higher ROI than any other acquisition channel,” says Josh Reyes of SmartrMail. Our respondents offered a number of tips for succeeding with paid ads on social media. Paperlust’s James Boston also notes that you may need different approaches for organic and paid social campaigns. 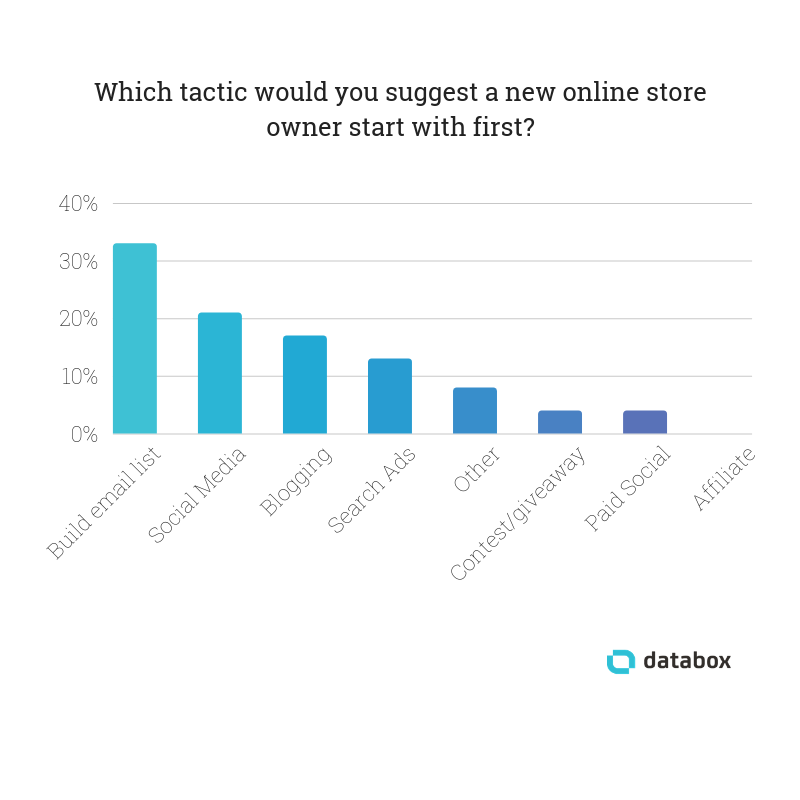 While content, influencers, social media, and paid search and social topped our list of the most effective ways to promote a new online store, our respondents also shared some additional ideas for promoting your store both online and offline. So Which Promotion Tactic Should You Choose? Hopefully, you now have tons of ideas for new ways to promote your online store. But where should you start? 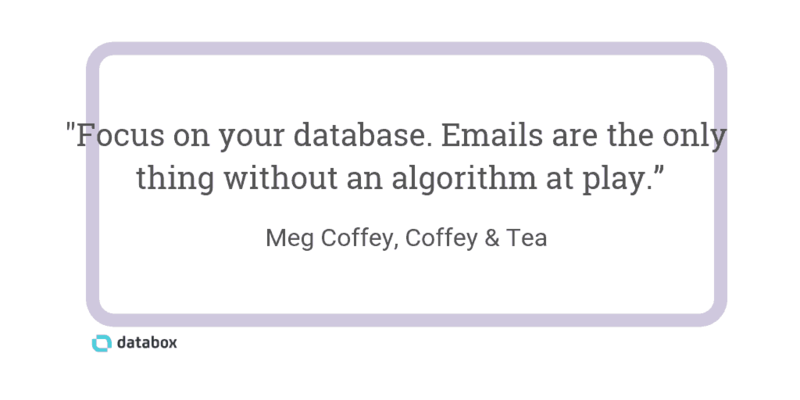 Building your email list is a great place to start because you can do it on a tight budget, and you can use the email addresses you gather in every other campaign you run in the future. If you decide to start with something other than building an email list as your first promotion tactic—or if you plan to promote via email and another channel—make sure to consider what channels are going to be best for the price points of the products you’re selling.